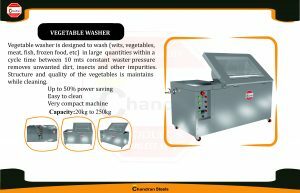 A high range of fruit & vegetable washer is manufactured by our company using food grade stainless steel. Available in various sizes, our range can be customized as per the specifications detailed by our clients. Water is sprayed on the raw material through out the length of the drum. 2,Fully Automatic System Of washing process. 4,Heavy Duti Washer Pump spreding water low consuming. Established in the year 2005, we, CHANDRAN STEELS are a highly acclaimed Manufacturer of premium quality Bakery Equipments, Cold Equipments, Display Equipments, Dish Washing Equipments, Cooking Equipments, Kitchen Equipments and many more. We are also providing Kitchen Equipment Repairing Services. The products offered by us are manufactured in strict compliance with industrial standards of quality by using the best raw materials. These are available to clients in different specifications of shape, size and design. Our products are highly acclaimed for their easy installation, lengthy lifespan, stylish looks and sturdy built. These have fewer maintenance requirements, because of which they are highly demanded in residential and commercial kitchens. We conduct strict checks on the quality of our products in order to assure clients of their unbeatable quality. The routine quality checks are conducted on various parameters by a team of competent professionals.